Choosing a wall paint color to complement your cabinets is an important part of developing your kitchen color scheme. This is a guide about painting a kitchen with orange cupboards. 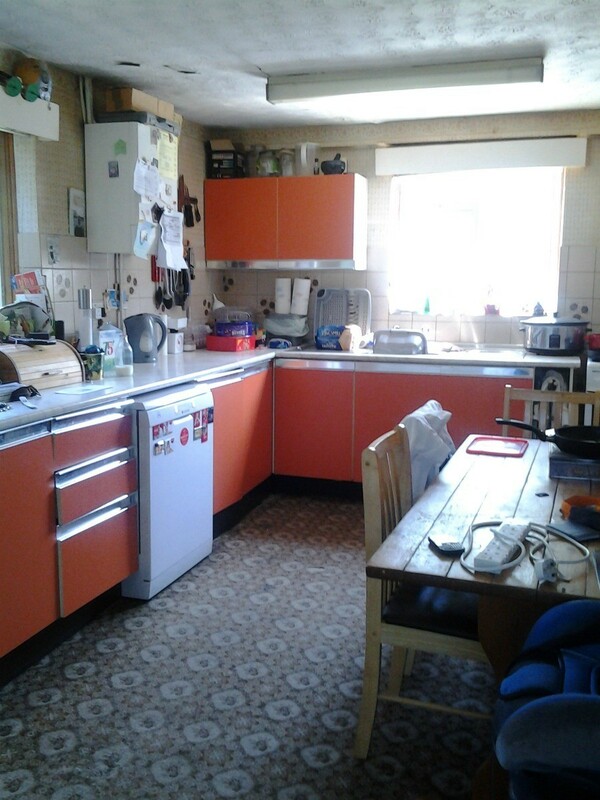 I have orange kitchen cupboards and need to redecorate. What colours should I use? It is a L shaped kitchen. I can't afford to change cupboards, so I need to change the walls and maybe the floor. They are just a bit brighter than burnt orange. Try a pale yellow on the walls and light wood or wood look floor. Try and find fabric with both colors for curtains. Also looks like you have a textured ceiling, usin a 6" putty knife or taping knife, scrape the ceiling (doesn't have to bee completely smooth, just scrape off the 'knuckle grabbers) then paint and you will find the ceiling just fades into the background. You can't make a leopard change it's spots. You have a retro kitchen so go with it. Shop second hand stores for retro stuff. Enamelware in pale yellow or robins egg blue would be cute. Or I'm sure you could find Fiesta ware dishes and containers that would coordinate. Get an old Coke sign for the wall. I love the cabinets and think you could make it look really good with a little time in the thrift stores. Paint the walls in a matching, or a shade darker or lighter, than the cabinets to have a more uniform look. We don't have enough money to get new cabinets, nor do we have the time to sand and restain (2 kids under 3!). Our cabinets are oak and stained a pecan color. I don't like how they appear a bit "orangey" looking. What color would work well on the wall to pull the darker tones out of the cabinets and "mask" the orange a bit? A dark brown? Tan? Light creamy green? I'm scared to paint because I don't want the cabinets to appear any more orange. Go with a color opposite on the color wheel. This is "gray" the appearance of the color somewhat. Or don't refinish the entire cabinet, try just the doors or the frame space between them, but I would put up some color chips first. If you are limited on time, here is a trick I have used. Using colored pencils or crayons, match the color of the cabinets. Then color other pieces of paper colored the colors you are considering. Or get paint chips and do the same thing. For best results, do this mix and match in the kitchen itself so the lighting will be the same. Good luck. This will not help you to choose a color but I can tell you that the orangey tone on your cabinets comes from using a poly varnish that is oil based. Always use a water based varnish and you will have no problem. I think Chloe's suggestion is good. I would think a green along the sage lines might look good. I would think a green shade might work, too. I know that a green concealer works on skin to cover up a red pimple or sore, so it might work to counteract the orange shade. Any shade of brown will only contrast with the orange shade of your cabinets making it more obvious. Actually going with a color in the orange family like light peach will make the cabinets look more brown. Home Depot and paint stores offer to mix a small jar of paint as a sample for you to try. I have orange golden oak cabinets, black appliances, gray brown floor, and brown dark light backsplash. Please help me on a wall color. What color paint would go with orange oak cabinets and a countertop that is St. Lawrence Bedrock color? This a beige color and my flooring is beige mix, also. What wall color goes with very rich (orangish) golden colored oak kitchen cabinets? I have tried Nantucket Gray (BM paint) and other muted gray greens and they look horrible. I do not know what to do because I have stripped my wall paper and need to paint. Try a "dusty" green or muted green. It will tone down that orangy color. Look at the color wheel opposite the orange and you'll see the complimentary color. Look right next to orange and you'll see variations that will work. Write down the color number/name and take it to the paint store and look at the paint charts they have available. If you look at the lighter shades of a color, you may find one you think compliments your cabinets, provides brightness and is still soft. A worker may help you with finding that perfect shade you're looking for.